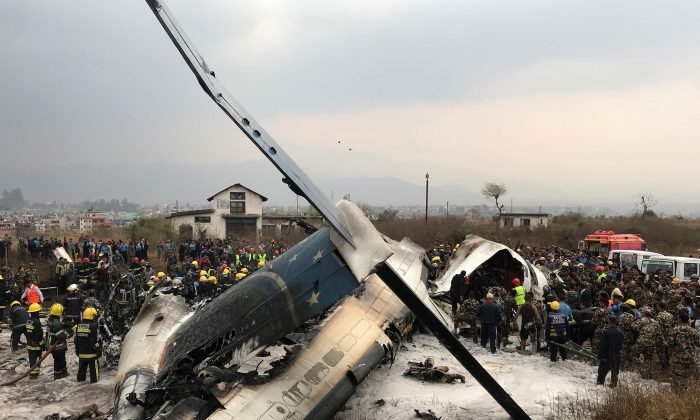 KATHMANDU—A Bangladeshi airliner with 71 people on board crashed on Monday while coming in to land at the airport in the Nepali capital, Kathmandu, killing at least 50 people, officials said. 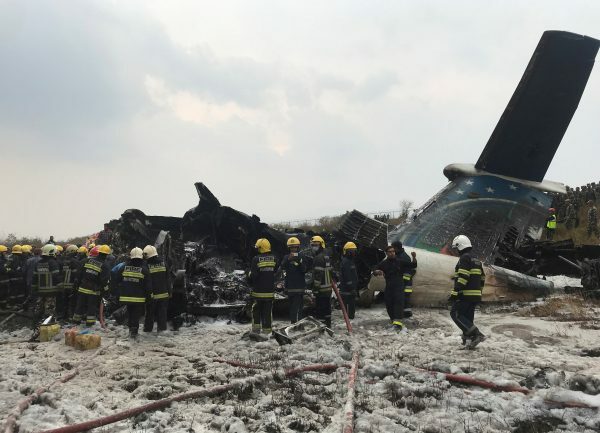 The plane, operated by US-Bangla Airlines, was on a flight from Dhaka when it hit an airport fence and burst into flames, said Raj Kumar Chettri, general manager of the hill-ringed airport, which is prone to bird strikes and other hazards. “We have recovered 50 dead bodies so far,” said army spokesman Gokul Bhandari. Several people had been rescued from the burning wreckage of the Bombardier Q400 series aircraft but nine people were still unaccounted for, he said. The aircraft burst into flames and came to rest in a field near the tarmac of Tribhuvan International Airport. Many of the bodies that lay on the tarmac covered by cloth were charred, witnesses said. Thick plumes of smoke could be seen from the aircraft. Later, photographs showed the fire had been put out, with army personnel and rescue workers at the scene. Data from tracking website Flightradar24.com showed the aircraft was 17 years old. The aircraft descended to an airport altitude of 4,400 feet and then ascended up to 6,600 feet before crashing about two minutes later, the website said. Mountainous Nepal is notorious for air accidents. Small aircraft often run into trouble at provincial airstrips. A Thai Airways flight from Bangkok crashed while trying to land in Kathmandu in 1992 killing all on board. The recent military confrontation between India and Pakistan in the Kashmir region is likely to bring Pakistan even closer to India's regional rival China, experts say.